If you are having trouble with the ticket system please send an email to support@searchwp.com and include your license key with your request. Email submissions will be answered in the order they are received. Please allow up to three business days for a response. Support requests submitted via this form will be ignored. 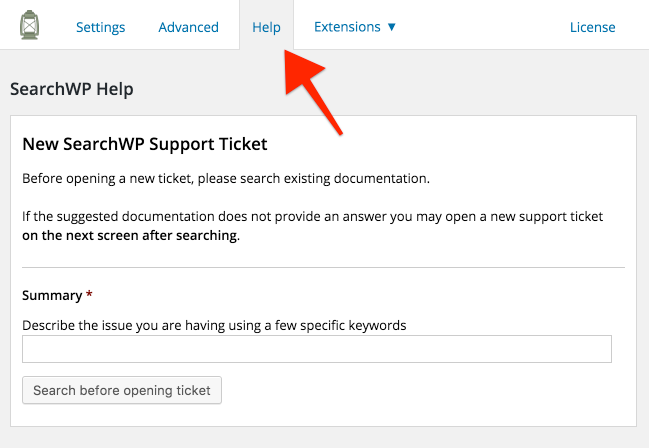 Please use the ticket system found in your WordPress admin. There is a Support button on the main SearchWP settings screen that was introduced in version 2.4.5. If you are having trouble activating your license email support@searchwp.com and include your license key with your request. No trial available. There is not a trial version of SearchWP available. Please note that there is a 14 day refund policy pending a support request that cannot be resolved. For more information please see the Terms and Conditions. Support requests submitted here will be ignored. Support is available to active license holders using the link at the top of the main SearchWP settings screen. If you are having trouble activating your license and cannot open a ticket, email support@searchwp.com and include your license key with your request.